Questions: What did you have for lunch yesterday? Oooh, I love the idea of the poached egg on the salad! Looks delicious! I never tried poached egg on a salad! That sounds good! I had a Southwest Chicken Salad yesterday with black beans, corn, leftover grilled chicken and tomatoes. Really good! 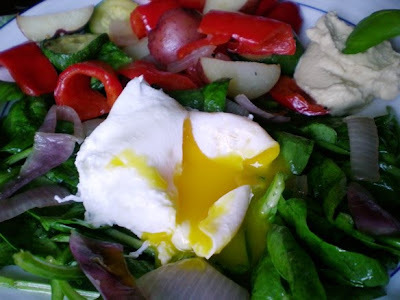 Poached egg on salad sounds strangely delicious... I love the idea of a yolk dresing. Glad you liked the new exercises. Thanks for visiting. Appreciate it. Yummy salad, making me hungry. Yesterday I had a toasted tuna fish sandwich and I mixed in 1 tablespoon of dried cranberries and of course I had a salad with it. Great looking poached egg on the salad! Yesterday my lunch was very simple, a piece of whole grain Great Harvest bread, with butter. I also had a large bowl of cooked veggies with melted cheese, so delicious. It was at the office and all I could "concoct" out of my bag of goodies was a taco, made of Ezekiel 4:9 sprouted wheat tortilla, and guacamole made with raw corn and avo and a splash of some hot sauce I found in the kitchen. (surprisingly tasty) but weird. I could have eaten more. some days are like that... funky. dinner was not much better but my head just wasnt' into cooking. LOVED your post about kids + vegetables yesterday. my mom had the same mentality, and to this day, there are very few veggies i don't like. Yesterday I had some leftover meatloaf on an ezekiel muffin to make a yummy meatloaf sandwich :) Had it with my VEGGIES ;) Twas very good!!! Yummy! That looks absolutely delicious! Mmm...I love the little pool of yolk in the center there. Love it! Yum! Looks good! You know I never put egg in my salads... no idea why, but eggs are always the "main attraction" in my meals.. lol! Yesterday was a "snacky" day, so had some of this, and some of that! Yesterday I had For the Love of Cooking's Baked Penne and Meatball Pasta - nom nom nom. I had half of one of those little bitty watermelons! So good! Still can't stand runny eggs, but my husband loves them that way. I finally watched a youtube.com video to figure out how to poach an egg - I am a much better visual learner than reading about it! I had my homemade Panera broccoli cheese soup - I hope you do make it, you'll love it! Nobody's telling this lady to eat her veggies either! Veggie sandwich for lunch yesterday, a mondo tossed salad today! Veggies rule and make me drool! What a genius idea! 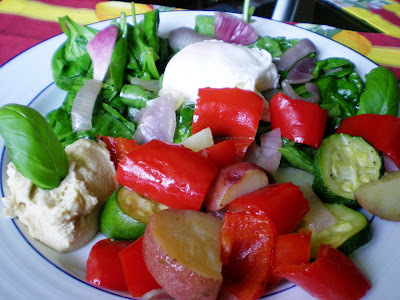 I've put hardboiled eggs in salads, but never poached! I love it!!! Ooh, that perfect egg really seals the deal.